I did a vegan hack for this recipe for myself (my husband had the cheese though!) by mashing some white beans along with some seasoning and herbs and nutritional yeast and lemon rind and spread this onto the tortilla before topping it with the mushrooms and kale mix. It totally worked and kept the filling together too. Fearne Cotton is one of our best-loved television and radio presenters. She is also a keen healthy baker and young, busy, working mum who has found some great ways to eat well and eat clean. 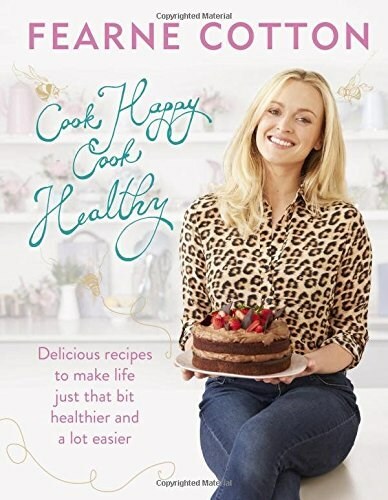 Her first cookbook, Cook Happy, Cook Healthy, is full of easy, fast and healthy recipes for everything from breakfast and speedy suppers to baked treats. Delicious dishes include Quick Granola, Courgette Fritters with Herby Yoghurt Dip, Halloumi and Roasted Beetroot Salad, and Almond and Apricot Biscuits. With an eye to food bills and time-poor households, the ingredients are easy to buy and few in number, and the methods very simple.